In spite of all the crimes, turmoil and killings threatening to cripple the once famed ‘Friendly City’ of Montego Bay, there are still milestones and achievements to be proud of. The latest comes in the form of sports and rewards the long, grinding efforts of a lowly-born athlete, namely, Shameera Sterling. Shameera, one of Montego Bay’s and Jamaica’s most talented and revered young netball prodigies has made her city, family, friends and close watchers proud, by inking her first professional deal, one that sees her plying her trade in Europe. She has since made her debut for the team, an impressive performance in a 55-44 victory over the UWS Sirens. The teams will again be in action on February 24 when they take on Celtic Dragon. 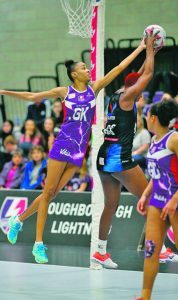 Born and raised in the second city of Montego Bay, 22-year-old Shamera Sterling, who hails from slums of Hart Street in the city, has signed an initial eight-month contract with Loughborough Lightning in Leicestershire in the England Professional Super Netball League. The skinny player Shameera, who left the island on January 3 to take up the contract, is expected to be with the club until the middle of July when the season will come to a close. Introduced to the sport at around age ten while attending Corinaldi Avenue Primary, Sterling then transitioned to Anchovy High where she made a brief stop before being shipped off to Kingston where she attended netball powerhouse at the ISSA level, the Queen’s, for just over two years. 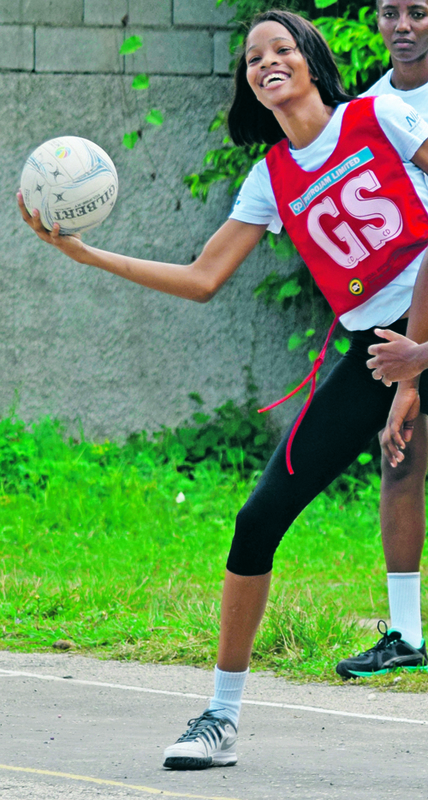 After her stint in the capital, and having gained more experience, Shameera returned to MoBay where she was reunited with old friends and coaches and did 1 year at Herbert Morrison Technical High (HMTHS) in the 2014-15 calendar year, under the watchful eyes of Rita Spence, a former national player and now coach. Sterling was also offered a full scholarship to the University of Technology (UTECH) but for whatever reason, she failed to take up the offer. She later got and accepted one to UWI, where she was before leaving to take up the contract. Versatile and capable of operating in multiple playing positions, with command, Shermeera’s first introduction to the National setup came when she was about 15, but she was not selected for an Under-16 tournament as she was said to be over the age at the time. However, her big breakout in the National senior ‘Sunshine Girls’ came in 2012. She was catapulted into the National Undert-19 programme and excelled before being given a chance to play against the South African team. The skinny-built Shameera sent shock-waves through the crowds with her electric and commanding performances, delighting even her opponents and came in for high praises, catching the eyes of the senior National team coaches, who then called her in to play in the three-match series and as they say, the rest is history, as she has not looked back since. Gina Haughton, the now President of the St. James Netball Foundation, told the Western Mirror of her delight of the achievements of young Sterling, but was quick to add that with so much talent on offer, St. James can soon assume the role of being a nursery for the National Netball setup. “We have so many players worthy of a national call up” she said. Haughton is also hoping for continued development and growth of the sport in MoBay but continues to bemoan the lack of support being given by corporate Jamaica. Jacinth Carey, who has been at the forefront of Shameera’s development, nurturing her talent from an early age, told the Western Mirror of her delight. “I am truly, truly happy for her, she has worked hard, suffered a lot, kept her eyes on the dream and she is now reaping the rewards. She is not the only exceptional talent we have here, but I hope this opportunity turns out well and sets the tone for many more from out of Montego Bay,” a beaming Carey noted. Carey was speaking of another national starlet, Carlalee Tinglin, who herself is a part of the national set-up and is currently pursuing a Degree in Literacy Studies, also at UWI. Shameera told the Western Mirror from her home in Leicestershire, that she was happy with the experience, adding that she is hoping for an exceptional season in helping her team to the championship podium, or a at least a place in the top four. She is also eyeing a bigger contract with the club or a move either to Australia or New Zealand. Shameera told this news entity that she has been well-received by her new teammates, whom she says think “her presence adds value to their brand”. She also saYs the playing style and methods of training are way more advanced.